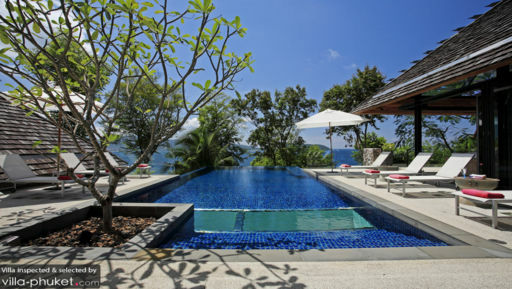 Villa Leelavadee is a luxurious, four-bedroom holiday villa in Phuket, overlooking Patong Harbour providing sprawling views of the Andaman Sea. The villa features contemporary interiors and not only does it afford a sanctuary where guests can relax and rejuvenate, it even provides amenities like a gym, games, room, media room, and a private pool deck for the best time of your life. If you’re traveling with friends or family, this is the right place for you as you have splendid views of the ocean from the infinity-edge swimming pool and five-star services so you can spend time in the lap of luxury! Four, stunning, and air-conditioned bedrooms are part of Villa Leelavadee that attach to private balconies or the deck from where you can enjoy the view in your own time without interruption. Lounge outdoors or sleep on your king-sized or single beds for a relaxed day-in. There are TVs in the bedrooms as well for your enjoyment so you are never bored. While glass walls looking out to the verdant foliage, you can lie on bed and take in the natural ambiance. Each of these bedrooms attaches to an en-suite bathroom which is either fitted with a luxurious freestanding bathtub or a tropical shower or both! An infinity-edge swimming pool that extends out to the ocean is the perfect ingredient to a perfect tropical holiday. While you chill in the pool’s crisp, blue waters that seem to sparkle on its mosaic-tiled floor, the fresh breeze will make your day. The pool has a unique future in that it features a glass panel running breadth-wise on its floor that peeks at the floor underneath! The pool deck is furnished with sun chairs for tanning or to lounge in the open air. If you would like, there is an alfresco dining area set against a mesmerizing view of the horizon where you can have a feast and even a BBQ. As you descend the steps, there is a private Jacuzzi on the terrace for a tranquil water therapy amidst luscious vegetation. 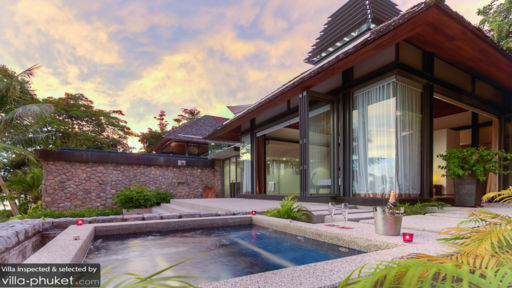 Villa Leelavadee is proud to present an open-sided living area that is connected to the pool deck for easier access. The hardwood floors and soaring ceiling maximise the room and make it even cosier for a relaxed afternoon spent lounging and lazing about. The white couches are great for a nap or to snuggle up with a good book, while the natural lighting and fresh air flood the room. A media room with comfortable sofa and projector screen, as well as a games room with a pool table are also accessible to guests. The dining area features an eight-seater dining table with all-black furniture if you wish to eat indoors instead of outside. The kitchen is fully-equipped with necessary amenities and equipment for your convenience. A fully-equipped gym with equipment fit for all is found in the villa as well. The villa is fully-staffed with personal guest assistance so that everyone has what they need to make their stay even better. There is even a sauna at the villa to cleanse your body of any and all toxins and leave you feeling refreshed. For services like massages, car rentals, and personal chef, you can make a request and these can be made available at a special cost. Idyllic location right on the beach, the villa allows you access to move around the island with ease as everything is close by. You can head to Patong beach with ease, and even head to Kalim beach if you want to participate in a surfing competition. In the evening, it is highly recommended that you visit a beach club like Iguana beach bar for drinks and dancing!